Jod Enskeline, master of the driveship Rimjack, was a free trader traveling from one alien planet to another in his restless search of the universe. Then he landed on Peter’s Rock, a forgotten planet of humans, ruled by priests and harboring a treasure of books holding all the extinct languages of Earth. The books would bring Jod a fortune, but in return for this uncountable wealth, he must take priest-voyagers on a dangerous mission—to find the Holy Shroud, the last relic of an ancient faith lost somewhere in the universe! 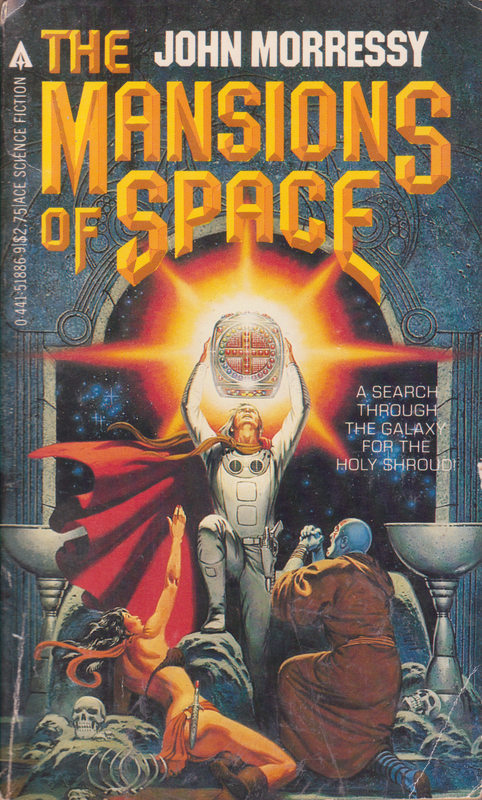 I make it no secret that I’m endlessly fascinated by the intersection of religion and science fiction. I’m not a religious person, it’s just something that interests me. I like seeing what authors think will happen to religion in the future, once we’ve mastered spaceflight or genetically engineered ourselves or met aliens or what have you. It’s obvious that if we make any of the groundbreaking discoveries that tend to dominate most science fiction, religion would have to take it into account somehow, even if simply to deny the thing. That’s a reaction too. This book seems to hinge on the Shroud of Turin being somewhere off in the universe. That’s what the back matter says, anyway. And that’s…fairly true. The Shroud does play a role in this novel, although it’s never once referred to as the “Shroud of Turin.” It’s just the Holy Shroud or something like that. And our characters don’t even have the whole thing. They just have a part of it. I’m not sure that it was ever stated which part they had, but the word “face” came up enough that, assuming they weren’t being religiously metaphorical, I think it was Jesus’s face. For the purposes of trying to enjoy this book, I was willing to ignore the fact that the Shroud of Turin is a hoax. I was going to take it at face value. After all, it’s less about the facts and more about the faith anyway, or at least that’s how I feel things should be. You can’t prove a religion true and you shouldn’t try. It’s easy to believe in something you know exists, much harder the contrary. That’s the point. Here I am sermonizing. Sorry about that. Let’s get on with the book. The back of the book lied to us again. Enskeline and the crew of the Rimjack aren’t on a dangerous mission to discover the Shroud. The mission’s hardly dangerous—there’s very little conflict in this book—and the priest-voyagers give very few craps about the location of the Shroud. Sure, they’d like to know where it is and they’d be happy to know that it’s been discovered again, but that’s not their mission or goal at all. I’m getting ahead of myself. Our hero for most of the book until he just effing disappears is Jod Enskeline. He’s a free trader. He’s got no associations other than his love of spacecash. He travels around the cosmos, apparently at random, and finds people and looks to trade with them. His life script comes to a startling change when he lands on CHRISTIAN PLANET. The planet is called Peter’s Rock. The fact that there’s a planet of Christians is notable because this book takes place so far in the future that human religion elsewhere in the galaxy has morphed into things completely different. Enskeline, for example, considers himself a “Mechanist,” which means that he conceives of God as an utterly inhuman entity that set the laws of the universe into motion and gave up there. The other notable thing about Peter’s Rock is that the natives have books. Real live books all the way from Old Earth. Even one of those books would be enough for Enskeline to buy a new starship. Middle Ages II/Vatican III: Where the world is run by an all-powerful church that controls everything and is the last vestige of civilization. This book pulled a fast one on me and bucked those trends. When I realized this, I started to have hope that this book would be good. Let’s see how that worked out! So the Christianity of Peter’s Rock is sweet, nonviolent, nonaggressive, love-thy-neighbor, love-thy-enemy, etc. It trends toward the Vatican III idea because there are abbots and monasteries and so forth, but I suppose what spares it from that fate is that it’s such a small community at the time of the story. The Abbot of Peter’s Rock tells Enskeline a bit about their history, which includes the fact that they once had a piece of the Holy Shroud on their colony but there was a schism and the other side took it with them. Astonishingly, but typical for these guys, the Abbot is like “We’re not mad or anything. The Lord will forgive them.” Enskeline figures he’s gonna go find this thing, not for the religious value of the Shroud, but because the reliquary in which it rests is the Ultimate Bling of the Galaxy. In return for some books, the Abbot asks Enskeline to take along a few pilgrims so that they can preach The Word to the universe. Enskeline tries to talk him out of the idea, saying that the universe is a hostile and dangerous place, but the Abbot and the pilgrims are steadfast in their faith. Here we get the other broad-stroke element of this kind of (fictional) Christianity: utter naïveté. So here’s what happens. Enskeline and the pilgrims (there are six to start with) visit a planet. There are aliens there called Wishbones. Two of the pilgrims learn how to communicate with the Wishbones and stay behind. Enskeline asks some other people if they know anything about the most important religious relic in the world, and everybody says no. A strong point in this book was the aliens. The author did a good job making original aliens that were very alien and not just humans with special noses. I’m serious. Genuinely great job. So they go to another planet and the same thing happens. They go to a third planet and they stay for a while because something else happens. Meanwhile, back on Peter’s Rock, some folks show up. They are representatives of the “Sternverein.” I think they’re trying to make a galactic federation or something? Other people think they’re fascists. I guess it’s a strength of the book that I just saw them as people. Anyway, they get settled in. At one point some space pirates show up and the Sternverein takes care of them handily, using something called ripguns. They do this all in secret because they think it would freak out the Christians. Enskeline and crew land on a planet called Huttoi. Things are bad there. The humans are barely hanging on to life while two alien species lord it over them. The Nandra are a subject race to the Altenorei, who are never seen. The Nandra do everything on their behalf. Anyway, the Altenorei decide they want the planet to themselves for some ritual. They don’t specify how the Nandra are to accomplish this, so the Nandra figure they’ll just wipe out the humans. Lots of people die. While all the people are dying, Enskeline is off looking for somebody who might know where the Shroud is. He gets caught in a nasty dust-and-rock storm and, in his moment of desperation and terror, begins to pray to Christian God. Sure enough, he survives. He converts. He stays in the wilderness for, like, a year. Then he comes back to visit the Nandra, the Altenorei, and the humans who are referred to, hilariously, as Hutts. So the middle part of this book really sagged, but I was thinking that things were about to pick up again and we’d end on a good note. Wasn’t sure what was going on with those German-sounding guys back on Peter’s Rock, but I was getting optimistic. Enskeline says “We need to unite the three races of Huttoi and commit ourselves to God.” Some people laugh at him at first, but then the Altenorei, who are wise and ancient and all that sort of thing, hear him talking about it and get interested. Sure enough, unification. They leave for space. Instead we cut back to Peter’s Rock and a guy named Cormasson. He’s also gotten it into his head to find the Shroud, so he sets off to do it too. He follows Enskeline’s old path, stopping off on every planet we’d already seen and asking if anybody knows where Enskeline went next. He gets some leads but they run out, so he has to look around blind now. This book is all about long timespans. Time dilation is a thing, and whenever our characters go off into space, it seems like a few days for them to arrive where they’re going but years have passed on the planets. I’m willing to accept that. It makes some sense. It also made things a bit awkward, but in a way I could get behind. For example, Cormasson would arrive on some planet and ask about Enskeline, and whoever he asked would have to, like, check the archives or something. Cormasson takes the reliquary and the Shroud and heads back toward civilization. It turns out that he’s been away so long that the homeworld of the Sternverein has gotten blown all to heckfire. He goes to Peter’s Rock, hands over the Shroud, and then dies himself. The end. I don’t often feel like a book has wasted my time. That might come as a surprise to you. Even bad books, even mediocre books, will have at least one thing I can latch onto. Something that I can at least point at and say “Don’t do that.” While I could say the same about Mansions in Space, I don’t want to. I was so disappointed that I don’t want to think about this book anymore. It had such a promising premise in a variety of sf that I enjoy so very immensely, and what it gave me was a narrative where nobody worth mentioning did nothing worth noting, and then those nobodies died. I’m not looking for big revelations here. Something I was afraid would happen would be that somebody finds the Shroud and it converts the whole galaxy because the Truth is Revealed or something. It didn’t. But nothing else did, either. When a sci-fi novel deals with religion, it better at least have something to say. Maybe that something is that religion is poison, maybe it’s the opposite statement, whatever. It might be less about faith itself and more about institutions either destroying society or keeping it alive. That’s fine too. Maybe it’s about exploring the science of religious experience or questioning what science might have to reveal about a faith’s fundamental precepts. I am willing to accept these things. This book did none of them. Religion was just kind of…there. It was, at best, a plot hook, and not a very good one, because after all, there wasn’t much of a plot. On the plus side, look at that cover. 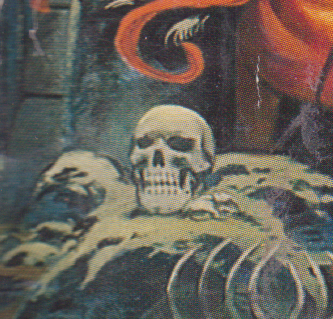 There’s a skull in the corner that I just love. I might make him my new avatar.